Hey everyone! Hope you are having a lovely Sunday. Today I thought that I would give you a little behind the scenes look at my blogging and tell you a little bit about my blogging essentials. These are basically all the things I gather together before I hit that publish button. Keep reading to find out what I need before I publish a post. Camera & iPhone 5S: The camera I use for my blog posts is the Canon Powershot SX500 IS. I've had this camera since 2013 and I absolutely love it. I do eventually want to upgrade to a DSLR camera when I have a bit more money but for right now this camera does the job perfectly. The quality is brilliant. If you're after a good camera for blogging but you can't afford a DLSR like me than I'd suggest this one as it is really good. For when I'm out and about sometimes I don't want to take a big bulky camera out with me so I'll just use my iPhone 5S for photos. The quality isn't that bad at all on my iPhone. Laptop: I just have a simple standard Packard Bell laptop but it allows me to type up blog posts simply. I do eventually want to get a Macbook as I want to get into youtube a little bit too but until then I'll be stuck with my regular laptop. You really don't need an expensive laptop to blog and mine has done me just fine for the past two years. Dana Fox's 365 Blog Ideas Book: This has become one of my blogging essentials for the past couple of months. Dana blogs over at Wonderforest and does blog designs and is incredible! If you followed my blog from 2013-14 then you will know my original blog layout was from Dana. In the last year Dana has also released a book. 365 Blog Ideas. I saw this all over instagram and then the lovely Kayleigh from CoutureGirl did a review and I knew right there and then I had to purchase it. It's honestly incredible. The book contains a blog post suggestion on each page and is super helpful and resourceful. I honestly don't know how I lived without it. Blogging Notebook: Once the photos have been taken I like to get my notebook and bullet point each point I want to talk about in my notebook with a few notes. I find it so helpful and it really does help me to make sure the post flows and isn't going off on a tangent at times. Sometimes it does like now for instance but if you haven't got a blogging notebook I'd highly recommend getting one as they are so helpful. Picmonkey: I honestly can't live without this website. I just find that this is the best photo editing tool out there and it's just so simple to use. It really is foolproof and the best part is that it's free! I would highly recommend it. It's what I've used to get text onto photos and use to make the photos a lot brighter. You can literally do everything on there! Highly recommend it if you haven't used it yet. Twitter/Pinterest/WeHeartIt: All three of these social media platforms are amazing for bloggers. I love twitter for interacting with bloggers. I've met so many amazing people on there, some of which I'm now lucky enough to call my friends. 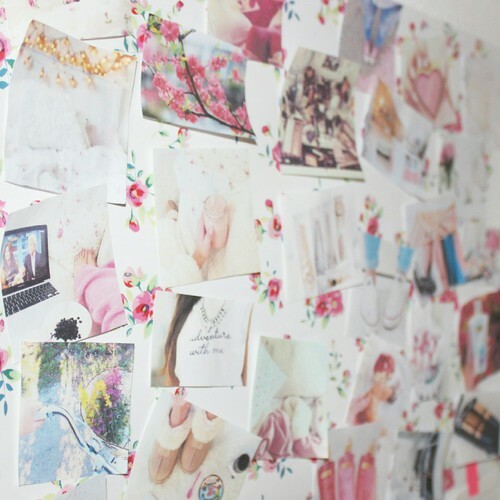 I also love pinterest and weheartit for finding inspirational pictures for blogposts. I just think they are perfect for when you have no photos taken for a post you can just find something relevent on pinterest or weheartit. Just make sure you put the source in your post! Bloglovin' App: Bloglovin' is just amazing for finding different blogs to follow, seeing what posts are popular at the moment which is great for inspiration and also following all your favourite bloggers too. I have the app on my phone too so I am able to read blogs on the go on the tube or bus when I'm out and about. It's just amazing. So there we have it. I hope you enjoyed this post about my blogging essentials. They are just so important I find when it comes to blogging. I would seriously be a disorganised mess if I didn't have any of these things. Just a little reminder too that you have just under 10 days left to enter my first blog giveaway where I'm giving away a Naked 3 Palette and a birthstone pandora ring. Click HERE to find out more information and Good Luck! What are your essentials when it comes to blogging? Great post :)! I really want to get my hands on a copy of 365 Blog Ideas! It seems as so many great bloggers are finding it useful! All very useful things to have when blogging. I think I'm going to buy myself a blogging notebook, because right now I just scribble ideas wherever I can and then they're lost to me!